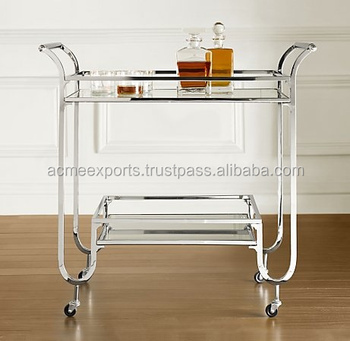 We are Acme Exports one of the Leading manufacturer and Exporter of All Types of Stainless steel Bar Carts , Bar Trolley. We also make products according to our customer requirement. We welcome your product queries and assure you for the best of our services, good quality product and most competitive prices. We will look forward for your query and requirements. Our High Quality Stainless Steel Bart carts gives the fantastic view at your Bar , Restaurents , Hotels as well as home too..
We also accept customise design from our clients. We provide best packing which avoid damaging. We also provide home delivery as well delivery to your Port or upto your airport. We are exporting all over the worls , Currently we are exporting in UK , USA , UAE , AUSTRALIA. Our Manufacturing unit since 1993, We deals in all types of metal hardware and handicrafts products.